Would you rather questions for kids can turn dinner time into a fun family event. 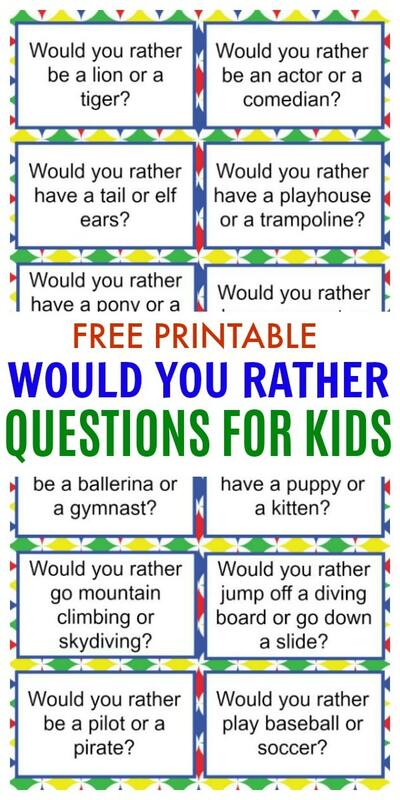 These free printable would you rather questions will get the whole family laughing and make great activities for kids! 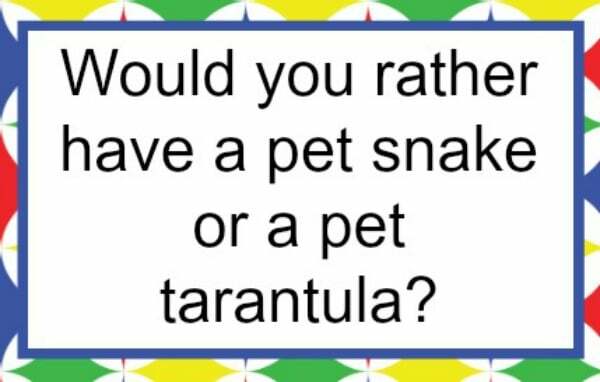 You may have never heard of would you rather questions for kids. These are simple questions the whole family can take turns answering. Each question gives you a choice of two things. Everyone says which thing they would rather do and why. The questions are geared towards kids, but the adults I know also get a kick out of answering!! My family always loves to expound on why they chose what they chose. These questions can be about ANYTHING. It is also fun to have people make up their own would you rather questions. Typically would you rather questions for kids are silly. The great thing about getting kids talking is you can take a silly question and make it into a teachable moment. For example the question, Would You Rather Have a Pony or a Monkey for a Pet, seems simple enough. If you ask your child a few questions about their answer you can really get kids thinking. Expound the would you rather question by asking your child what kind of care each of those pets would require. Does your home have the room for a pony or a monkey? Would a monkey get along with the other pets in your family? Asking your child questions about their answer will get them thinking about all the things that can go into the decision making process. I don’t know any parents who don’t want to spend more quality time with their children. Finding ways to connect with our kids and get them talking is a priority (or should be, lol). The problem is that most kids don’t want to just sit down and “chat” with their parents. If we can find ways to “talk” to our kids in a fun way it will be received so much easier. 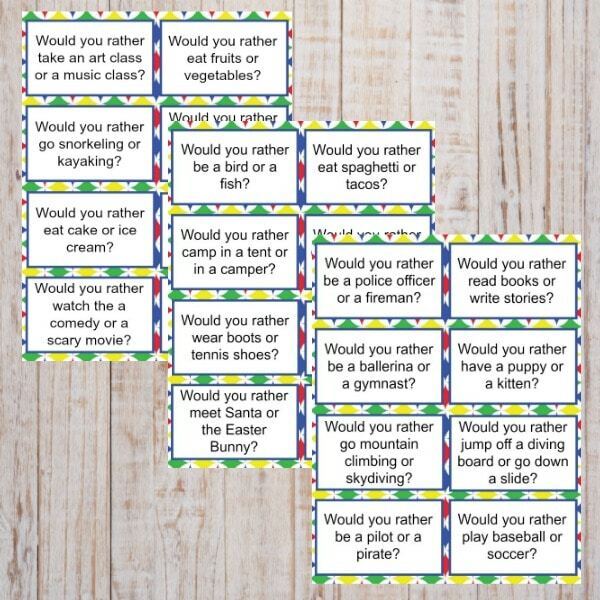 Would you rather questions for kids are a simple way to connect and talk to our kids and have fun at the same time. Kids won’t even realize that they are “connecting” with their parents too! 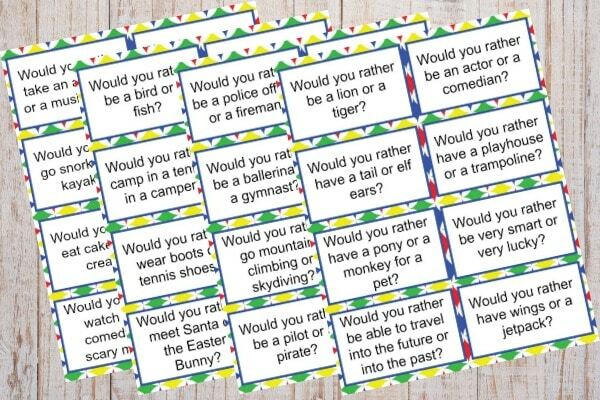 These would you rather questions for kids are great for girls and boys. The questions are perfect for getting boys and girls to think about all sorts of different topics. I have always encouraged my children to be open about traditional gender roles. If a question asks if you would rather be an astronaut or a mechanic, I want my girls to realize that these are not professions limited to just males. The same thing goes for my boys. If the question asks if you would rather learn to sew or knit, these are not hobbies exclusive to girls. I love to hear what my kids pick on questions that seem geared more towards one gender or another. 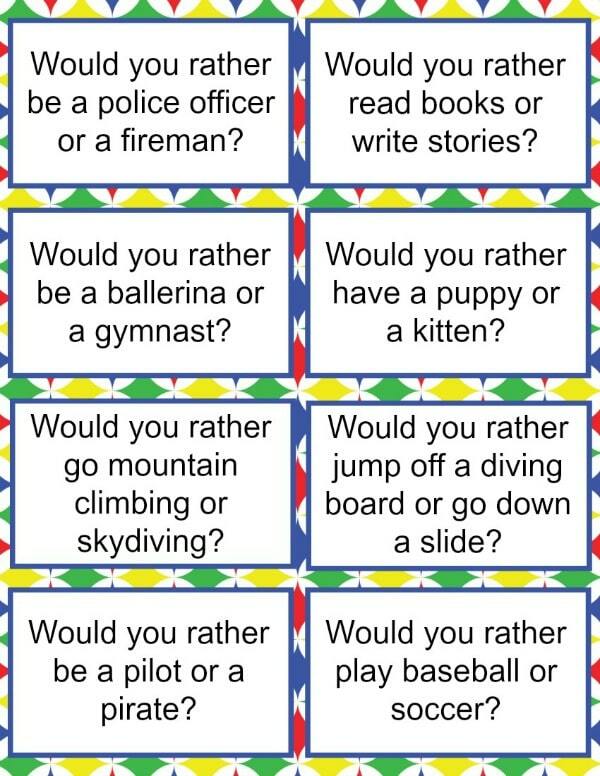 I have four pages of Would You Rather Questions for Kids available for you to download. Printing these off on white cardstock helps them last longer. I also like to laminate mine for extended use. If you want more ideas to keep conversations and laughs flowing at home here are some more great ideas. 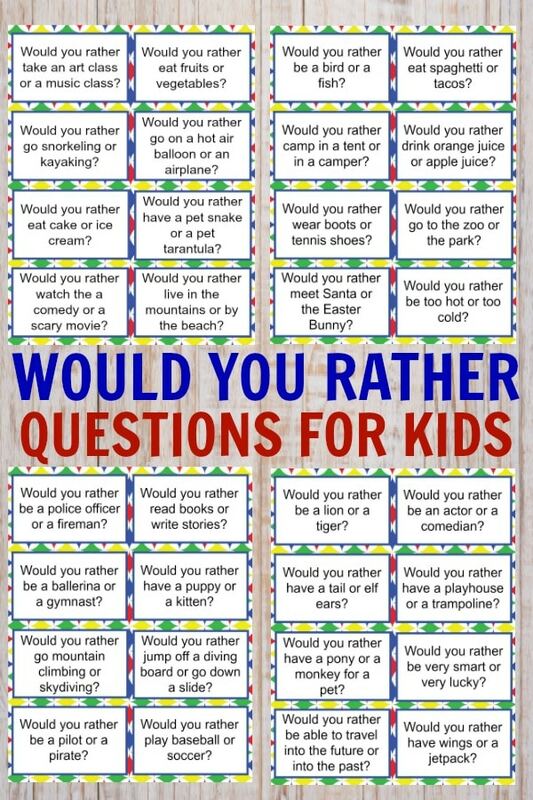 Be sure to SHARE this post with your friends so they can download and use these Would You Rather Questions for Kids too! These are so great, and would be wonderful when you’re waiting for appointments, restaurant, etc. Thanks for sharing.